Caroline, Duchess of Montrose; her sale, Christie's, 14 July 1894, lot 23 (unsold). Caroline, Duchess of Montrose; (+) Christie's, 4 May 1895, lot 72 (360 gns. to Gribble). with David Messum, London, prior to 1996. 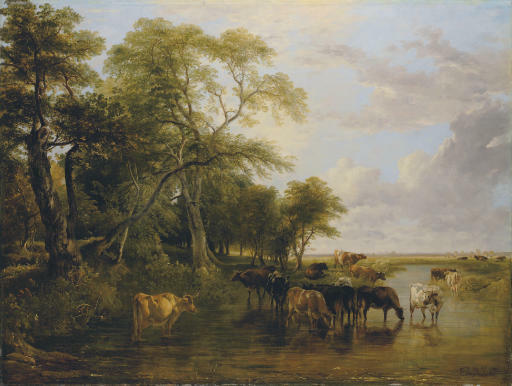 The Property of a Limited Company; Bonhams, London, 21 November 1996, lot 150, as 'The Watering Place'. An early owner of this picture was Caroline Agnes (1818-1894), third daughter of John Beresford, 2nd Lord Decies. She married James Graham, 4th Duke and 7th Marquis of Montrose but he died in 1874. She subsequently married William Stirling-Crawfurd in 1876. In 1888, she caused scandal when she married for the third time, a man much younger than herself. At her first sale, several pictures were withdrawn and the remaining lots failed to sell. When offered in her posthumous sale, this picture proved an exception, and sold for 360 guineas to Gribble. We are grateful to Kenneth Westwood for his help in preparing this catalogue entry. Please note that the catalogue measurements for this lot are the wrong way round.